Remember the Kleancolor swatches I planned on doing? Since I've never done swatches of an entire collection (or many solo swatches for that matter), I wasn't sure how to go about swatching efficiently. So I figured I'd start with a layered black polish for comparison. Since I wasn't too eager to do an entire hand of the same color, I opted for doing each nail a different color. Yes...each finger is a different Kleancolor layered over black. Um...yeah...I think these are meant to be worn over their corresponding color. Maybe even white would be better, but I'm always iffy about that. Don't get me wrong, each finger looks awesome, they just all look the same. So Kleancolor swatches have been postponed. Sorry about that. Instead! Work tomorrow is having the holiday party, complete with a secret Santa/white elephant gift exchange. I bought my gift and wrapped it, then thought that some Santa nails were appropriate to hand it off to some lucky sucker. Hey...it is white elephant after all. I Googled "santa nails" and, after scrolling through some designs I wasn't too keen on, I stumbled upon this great take on Santa's belt by Wickless & Polished. I liked it because there wasn't as much white as I've seen, and I'm always up (or down) for a manicure that makes my fingers and hands look a little delicate. Odd coincidence too that this is the design I liked, since I recently found out my own mom likes Scentsies! This cosmic world we live in man. So this is my interpretation, snazzing it up a bit with some glitter. Maybe this is slutty Santa fresh from the Halloween store. Either way, I don't like it as much as the original artist's. Her nails provide a better canvas than my recently filed fingers. The polishes used include Hey Sailor (China Glaze) as the base, Wet n' Wild's Rockin' Rubies for the glitter, and detailing using Sinful Color's Time Off, Bad Chick, and Flower Girl. My favorite of these polishes is without a doubt Rockin' Rubies. 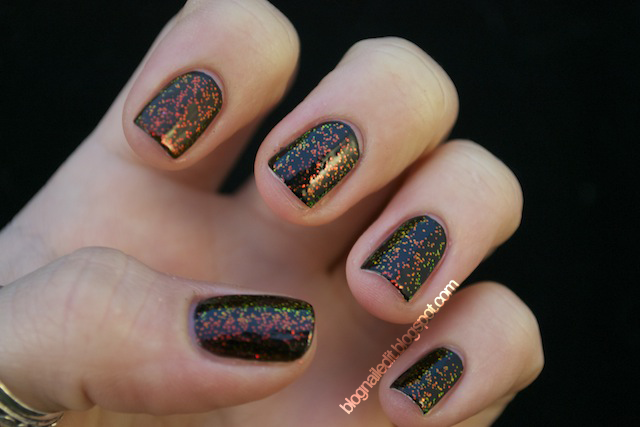 It's got little glitters and big glitters, technical nail jargon aside. Lovely manicures!! :D Very cute XD. Oh you are too sweet. Yours turned out just too cute! And I have the problem with my hands/nails not looking very feminine so polish sure helps with that :-p And yay for your mom being into Scentsy too! Good nummy stuffs there! Very cute! Everyone loves "slutty" Santas once in awhile! 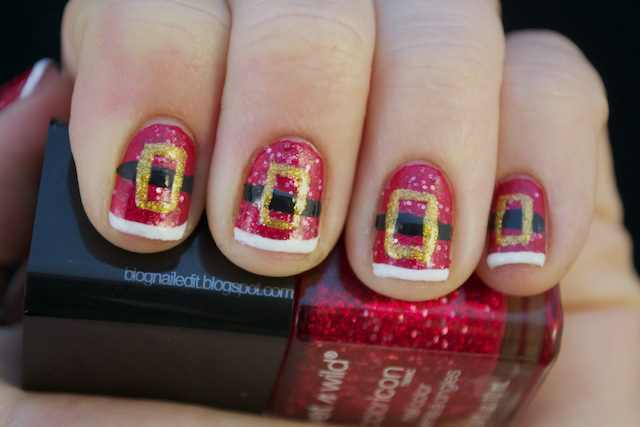 I love those santa nails!